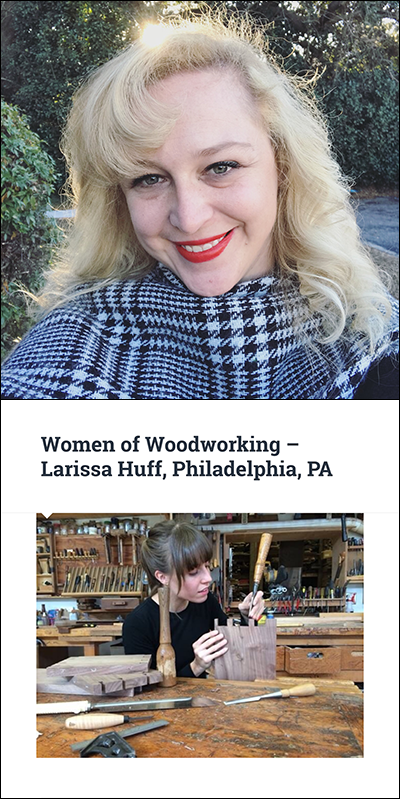 Women of Woodworking is a multimedia project focused on sharing the stories of women in the woodworking craft. I write essays, take photographs and engage the community on social media, mainly Instagram. I plan to expand towards videos and other opportunities to grow this project. This project fits in nicely with a lot of things that I love to do and am fortunate enough to do for a living. I love taking photographs, mainly portraits, but I’m rather new at that. I have always loved writing, meeting new people and telling their stories. I also design and make products for a living, so it’s relatively easy to talk about my colleagues who are doing fantastic work. My short answer is that I’m a workaholic with a lot of interests and I’m obsessed with creating things myself. I also think it’s good to have passion projects, because even if you love your work, it can still be “work.” Some people just need more than one creative outlet to explore their curiosities. When I started Women of Woodworking years ago, it was because I felt there wasn’t a thriving space on the Web quite yet for women in the craft—but we were out there, making our own space. I took a sabbatical from the project for a few years but it would never stop completely, because people from around the world would reach out trying to find a woodworker for a job, share a story or a photo, or simply to chat. I observed that this online community, appreciative of woodworking, had grown and was thriving, and it made me realize that the seeds a lot of us had planted a few years back, especially the woodworking women who came before us, were now flourishing. When I say we’re making our own space, we’re literally taking buildings and opening their doors to give women and minorities access to the craft of woodworking like never before, through schools, symposiums, studios, co-ops and retail spaces. I wanted to document this evolving moment for us, and saw that there was still a need to help continue the woodworking community’s passion and conversation. Diptych courtesy of Katie Thompson. Katie Thompson, with her woodworker-husband Joseph, also shares her thoughts on launching a handmade product-based business as part of my interviews—101 so far—with independent Makers. Furthermore, they give their point of view on design and designing in my series Designer’s Quest(ionnaire). And read more about the joy of side projects.